NOTE: File and variable references to the original plugin (written for Slack) have been left to simplify future modification and/or pull requests. vars.slack_notifications_webhook_url = ", e.g. https://chat.googleapis.com/v1/spaces/AAAAAAAA//messages?key=ABCDEFGHIJKLMNOP%3D"
vars.slack_notifications_icinga2_base_url = ", e.g. http://icinga-web.yourcompany.com/icingaweb2"
Note > Objects as well as templates themselves can import an arbitrary number of other templates. Attributes inherited from a template can be overridden in the object if necessary. The implementation can be found in slack-notifications-command.conf and it uses Lambdas! To test if notifications are working, go into IcingaWeb2, select a host or service, and choose "Notification" to manually initiate a notification. The slack-notifications command provides detailed debug logs. 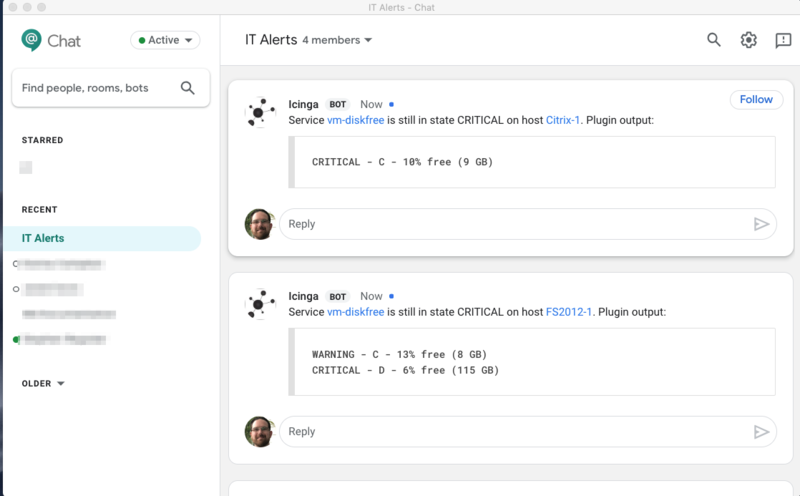 In order to see them, make sure the debuglog feature of icinga2 is enabled. After that you should see the logs in /var/log/icinga2/debug.log file. All the slack-notifications specific logs are pre-pended with "debug/slack-notifications"
tail -f /var/log/icinga2/debug.log | grep "warning/PluginNotificationTask\|slack-notifications"